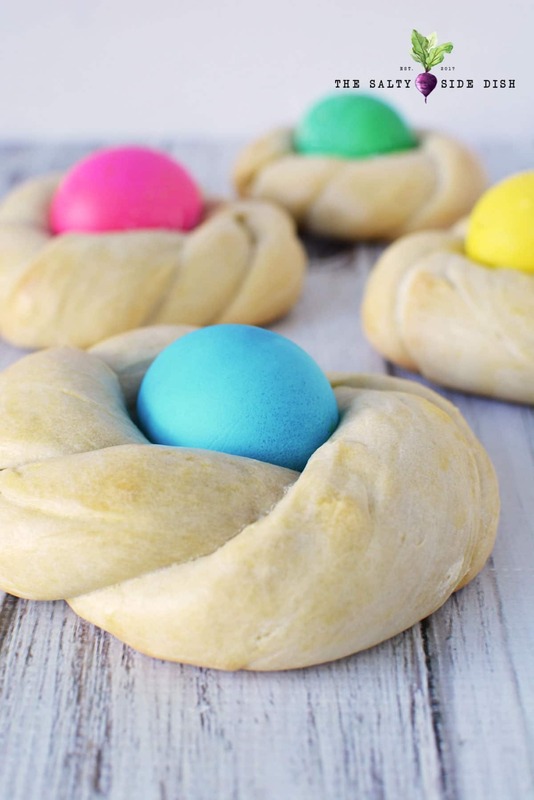 Italian Easter Bread is a Braided Bread with Bright colored Easter Eggs that makes a stunning display for holiday tables. Although delicious on its own, this sweet bread side dish can be served with icing or cinnamon butter and this recipe makes 4 individual Easter Bread nests for your family to enjoy. If I could have it with every meal, I would. There was probably a time I did…and then I turned 40. Now its only special occasions or after a long work out that I can indulge. Its either that or move up pant sizes, you know what I mean? Even so I still have some favorite bread recipes. 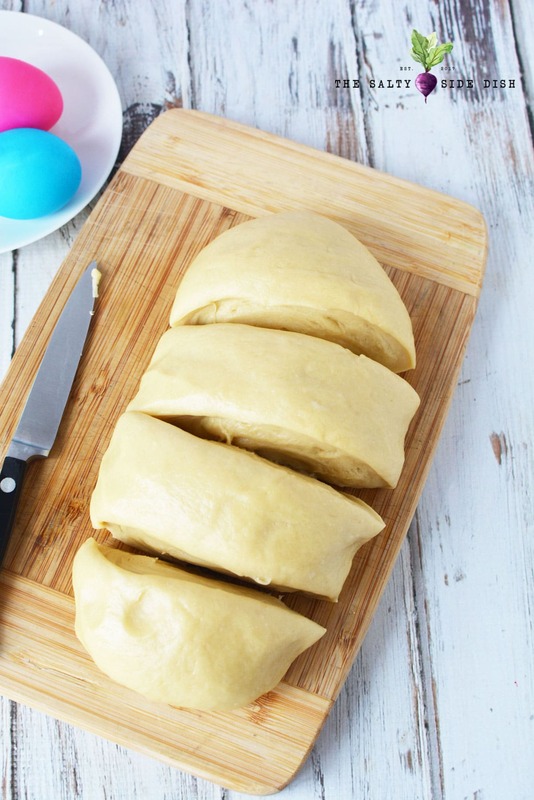 I adore homemade cake donuts, orange bread, and of course easy bread rolls, but this Italian Easter Bread recipe is also a great way to break that carb fast. You can always make a massive loaf and many do, but I prefer smaller individual breads for each plate. This recipe is perfect for a family of four, giving everyone their own braided bread, and we set the egg aside and smother in cinnamon butter before chowing down. This particular recipe is made without a bread maker or a mixer, but if you are an experienced baker, you can use them. Personally I always feel like the less cooking technology I use, the less chance I am going to have to mess it up, so I do breads the old fashioned way. Mix. Wait, wait some more, bake and eat. Remember, with most breads, you have to be patient. That yeast needs time to rise, which means you need to plan in advance to make. This Italian Easter bread recipe is for individual Easter breads for 4. Recipe Note: A friend of mine used to have a cooking blog and she closed it down and provided with me her amazing reader loved egg bread recipe. I remade the egg bread and am posting you her recipe here so you can make it too! I made this last year and totally forgot to put it up last Easter…so I didn’t want to miss it this year. When it comes to braided bread made for Easter there are many old traditions recipes can stem from. In some cultures, braided breads were to symbolize the holy trinity when braided and the red dyed eggs the blood of Jesus. There are Challah breads and breads meant to just break for worship but out of all the ways bread is often used, this Italian Easter Bread (some say Greek) is my favorite. 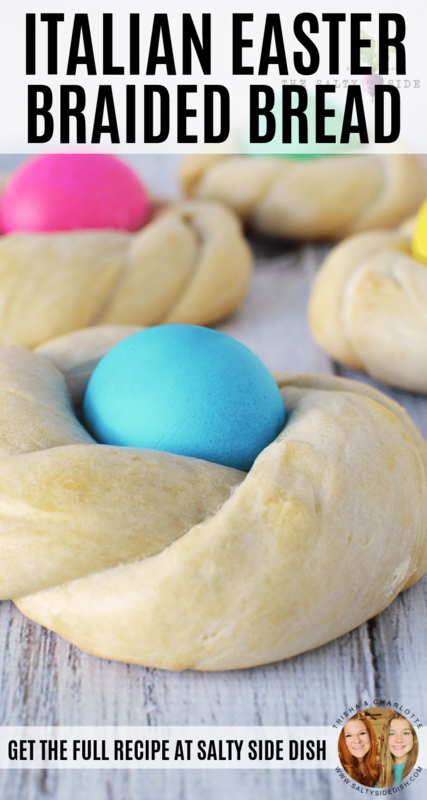 Sweet, tasty and a beautiful centerpiece, Easter egg bread is easy to make, delicious to eat and gorgeous on the table. 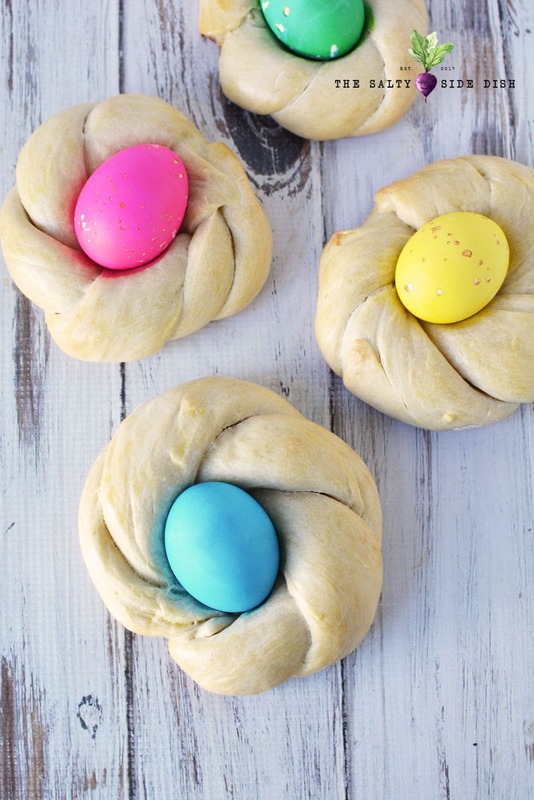 I love the simplicity of this Easter bread, but feel free to change it up with toppings. Its a sweet bread so any additions you make just add to it. Do you need to Boil your Eggs First? You do not need to boil your eggs first! The eggs will cook while the bread is in the oven. These braided egg breads are an individual serving for each person. I think they look totally cute and fun to eat. Grease a mixing bowl with nonstick cooking spray and set aside. Use egg coloring kit to color 4 raw eggs. Set aside to dry completely. Place yeast and milk in a mixing bowl and mix well. Let set 10 minutes. 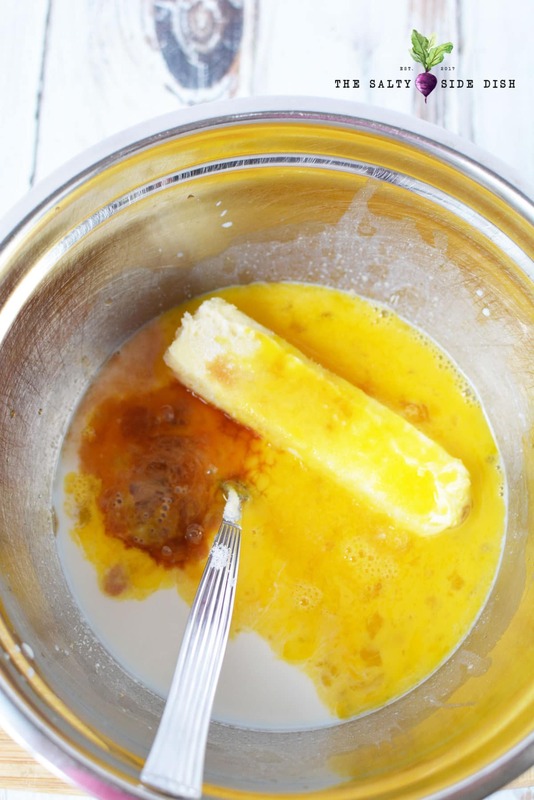 Stir in butter, sugar, 2 beaten eggs, salt and vanilla. Stir in flour, 1 cup at a time. After you have mixed all 4 cups, use your hands to carefully mix the dough to incorporate all the flour. 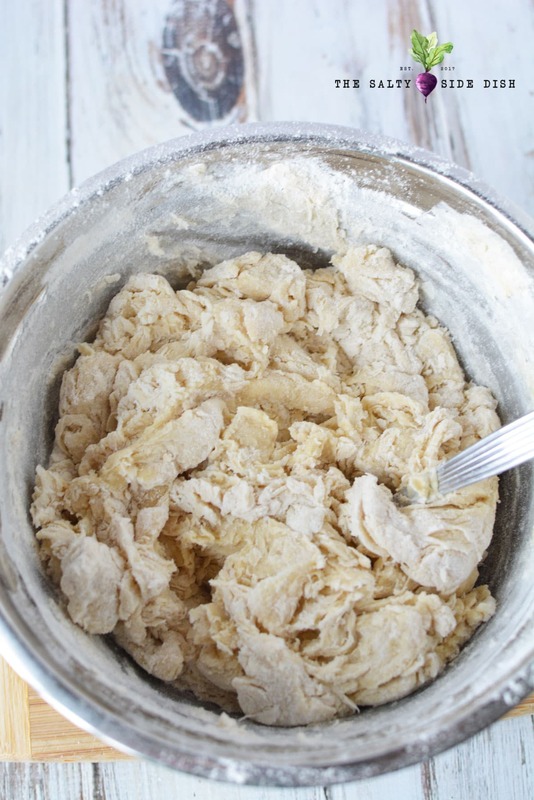 Turn dough onto a floured surface and knead for 5 minutes. 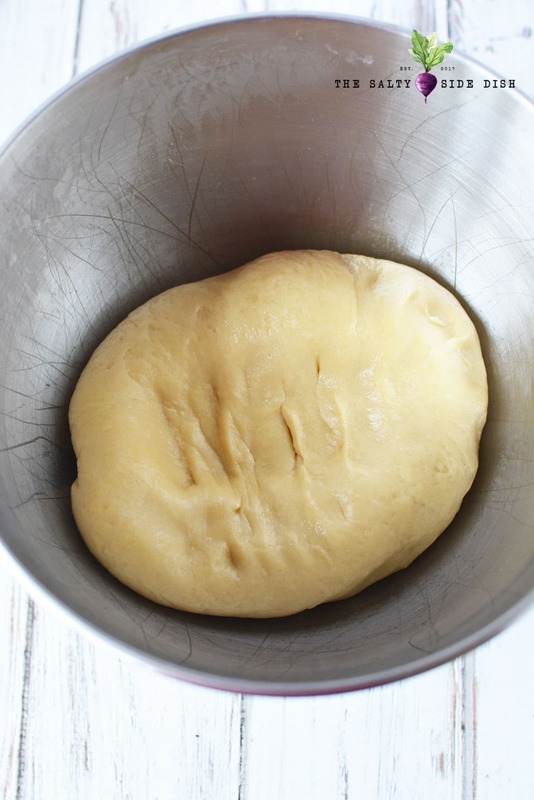 Place dough into prepared greased mixing bowl. Cover dough with plastic wrap sprayed with nonstick cooking spray. Let set for 90 minutes or until twice the size. Punch the dough with your fist and divide into 4 equal parts. Divide each quarter in half and roll into a 12″ length, keeping the dough about 1″ thick. 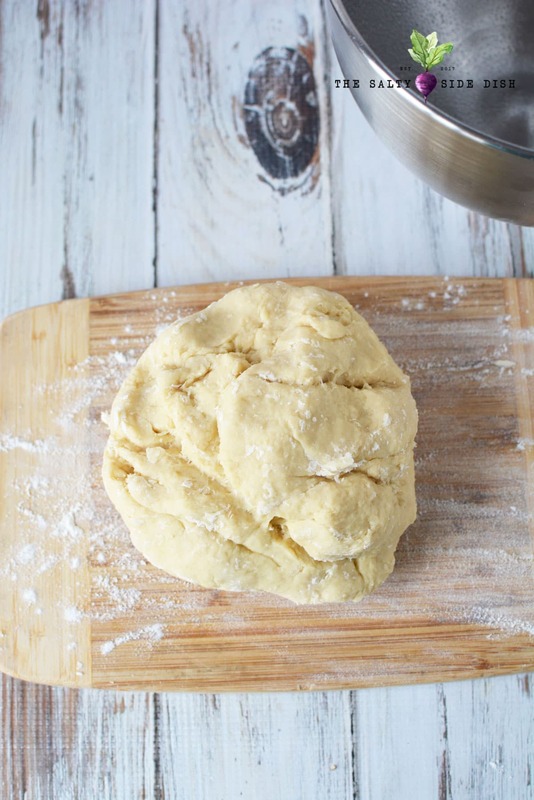 Twist the two pieces of dough together to create a rope look. Connect the ends and press together to make a circle. Place dough on prepared baking sheet. 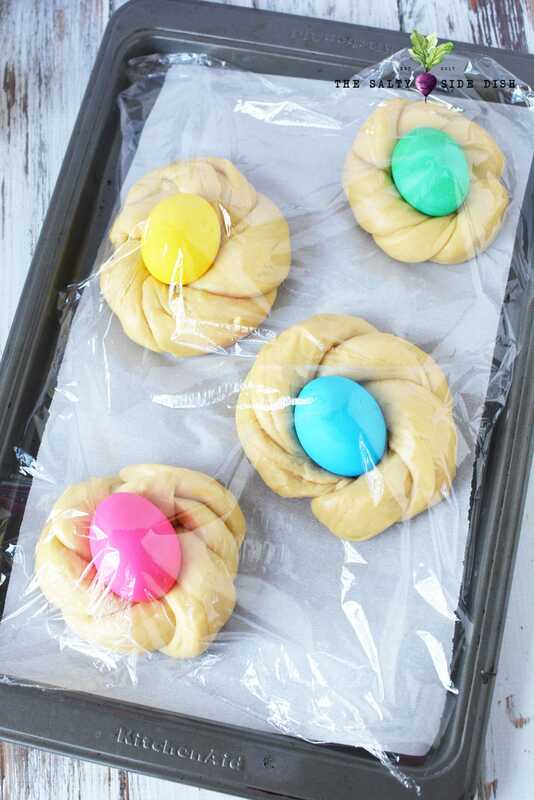 Place raw colored egg in the center of the dough. Repeat until you have all four rounds. Now you need to let the dough rise again for approximately 20-30 minutes. Cover with coated clear wrap. 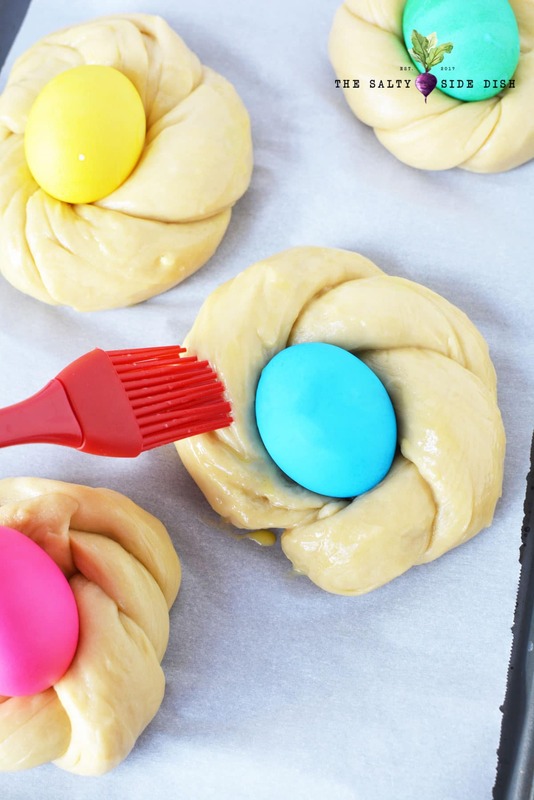 Carefully coat the dough with egg wash, avoiding the eggs. Even if its not Easter, you can make up this bread for a stunning bread side dish. Just leave out the eggs and continue with the recipe as is. Put in an airtight container to avoid going stale. If you have left over bread you are not going to eat, you can use it to make french toast casserole. Stir in flour, 1 cup at a time. After you have 4 cups, use your hands to carefully mix the dough to incorporate all the flour. Place dough into prepared greased mixing bowl. Cover with plastic wrap sprayed with nonstick cooking spray. Let set for 90 minutes or until twice the size. Punch the dough with your fist and divide into 4 equal parts. Divide each quarter in half and roll into a 12" length, keeping the dough about 1" thick. Twist the two pieces together to create a rope look. Connect the ends and press together to make a circle. Place on prepared baking sheet. 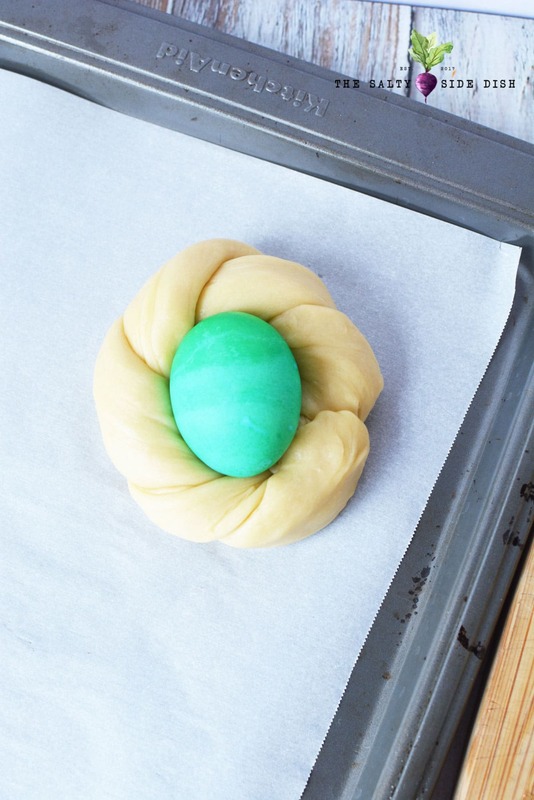 Place raw colored egg in the center of the dough. Repeat until you have all four rounds. Now cover the nests with a clear plastic wrap and let rise again for 20 minutes. Carefully coat the dough with egg wash, avoiding the eggs.